As my collection of crafting bits and bobs increases I keep looking for ways to store them. On one of my many trips to the local antique centre at Battlesbridge I came across this multi-drawer piece of furniture. The drawers are quite long and deep, so they can store plenty of buttons, beads and other paraphernalia. Perfect! 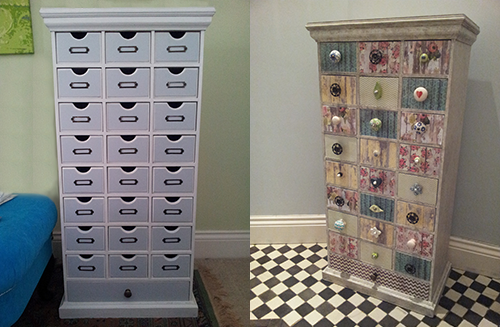 The unit is made from mdf in the style of these vintage catalogue drawers and although I love these original pieces, they often command a very high price, that is well over my budget. This piece was well within budget and also gave me a blank canvas that I could put my own stamp on. I painted over the main unit using a home-made chalk paint recipe (a mixture of paint, water and plaster of paris), and dabbed over the wet paint with scrunched up kitchen roll to give it some texture. I then bought a book of scrapbook papers that had some lovely weathered textures and pattern prints that I thought would look great on the drawers. I decided the shape of the front of the drawer would be too tricky to cut out of the paper, so I turned the drawers around and used the back as it was a simple rectangle. 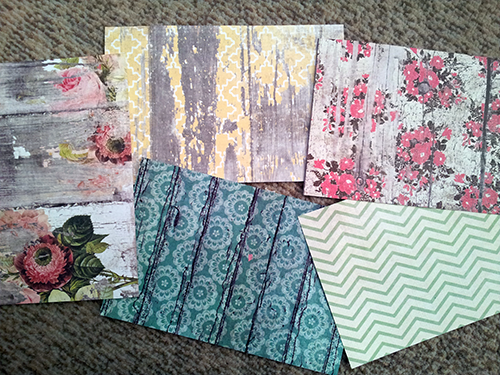 I then chose five of the paper prints from my scrapbook that were complimentary but provided a contrast. I measured the drawer fronts and cut out 4 or 5 rectangles from each pattern (I had a total of 24 drawers). I then used a small amount of PVA glue to stick them down and brushed over each one with a mix of PVA and water to give them a protective seal. Having turned the drawers around meant that I no longer had the little cut outs to open the drawers (obvious once I’d closed some of the drawers!) and I would need to add some handles. I’d bought a set of six drawer knobs from a market (many moons ago) that I’d never used, so they got me started. 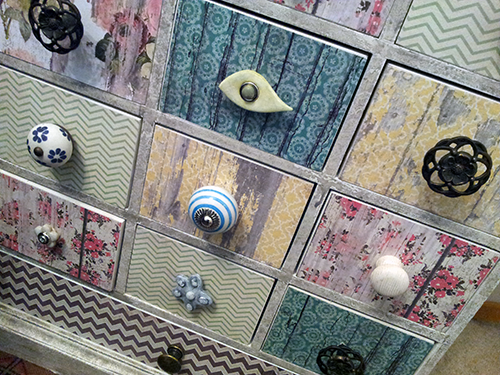 I’d also seen a selection of ceramic drawer knobs in a local shop that I really liked, and bought some of these. Finally, to keep the cost down, I bought some small and medium-sized wooden handles from a local ironmongers that were very cheap, which I decorated and I completed the set by making a few drawer knobs from polymer clay. 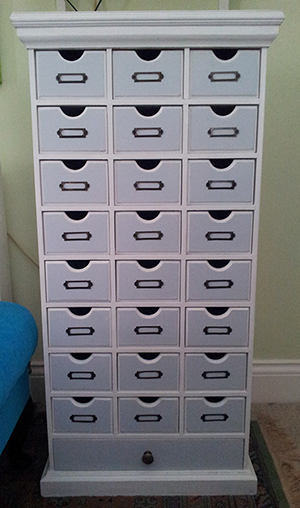 I drilled small holes into the centre of each drawer and attached the handles. This is the finished piece (before and after)! very nice project. 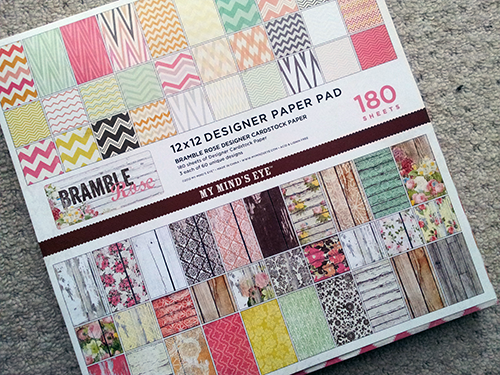 I’m going to try it using paper from wall paper sample books.